Welcome to another edition of The Beautiful Books, a writing prompt link-up hosted by Cait @ Paper Fury and Sky @ Further Up and Further In, this is where I answer questions related to my current WIP Novel Project, which is my Pushing Boundaries series, specifically Orion – Volume II. I’m a little torn on which characters to focus on for this post. For the last couple of posts I’ve been focusing on Mac and Cassie, mostly because James and Beth’s characters haven’t been working out in my head the way I want them to and, well, if James and Beth aren’t working out in my head, they’re definitely not going to work out on paper. But I was talking about The Unnatural Philosophy of Kit March (which you should totally go check out) with Kim. I mentioned how it was helpful to read Autistic characters written by an Autistic person, which lead to us talking about Pushing Boundaries and how I’ve been unable to make any real progress on it. It turns out I may have figured out what the problem with James and Beth is, knowing what to do about the problem is another thing entirely, but progress is still progress (no matter how small it may be). So I’ve decided that I’ll have a go at featuring Mac and Cassie as well as Beth and James. This is mostly because James’s problems with his parents and Mac’s problems with his parents are undeniably connected (or at least in my mind they are). James: Depends on your definition of parent. Emotionally, James considers his grandmother Rosemary to more his mother than his mother Emilia, but he also considers Robert to be his father (although he doesn’t say it). James’s biological father left when he was about five (James barely remembers what he looks like, but remembers a lot of the other negative things associated with him), which was about the same time James received his Autism diagnosis. Beth: Beth no longer has a relationship with Claire (her mother), due to her mother’s alcoholism and history of abusive behaviour, which can make her relationship with Isaac (her father) strained. Beth feels as though her mother wasn’t fully held accountable for her actions (Claire would never admit that she had been abusive and didn’t stop drinking, nowadays Claire just drinks less and goes to regular therapy sessions). Mac: Pre-Cassie Incident, Mac’s relationship with his parents Emilia and Robert was fine, but Post-Cassie Incident, there have been problems due to Mac drinking a lot and lashing out, which is unacceptable but he feels it’s the only option he has because he doesn’t know how to deal with it and his parents aren’t particularly keen to talk about it either because they don’t known what to say (they’re essentially hoping by pretending it hasn’t happened it will all go away). Cassie: Cassie gets along with her mother more so than her father (she has more, her father is an alcoholic and tends to be at the “angry/verbally abusive” kind of drunk, so she avoids dealing with him when he drinks and doesn’t know how to act around him when he’s sober. James: Emilia and his biological father grew up in Glasgow and met through mutual friends, Emilia was friends with Alanna (who is married to Beth’s Uncle John) and Alanna introduced Emilia to him. Beth: In Australia, Nurses and Cops tend to inter-marry a lot, so Isaac and Claire met via mutual friends at a Christmas Party. Claire was drunk and almost fell off a patio-deck, Isaac managed to prevent her from falling off and hurting herself and was sequentially stuck taking care of her for the rest of night (he ended up taking her home as he doesn’t drink). Mac: Robert badly injured his hand and had to go to the emergency department, that’s where he met Emilia, who is a nurse in the emergency department. Emilia came to the conclusion Robert was injuring himself just to see her and asked him about it, he responded that he was just clumsy but wouldn’t object to seeing more of her outside of the hospital. Cassie: Same sort of situation as Beth but both of Cassie’s parents drink. Beth: Beth would be a mixture of confusion and anger, it would be more dependant on who was making the comparison and which parent, if people were to compare her to her mother, it would frustrate her and she would then stop talking to the person, but she’s also resigned in a way to the fact that very few people know what kind of person her mother really is. Mac: Mac would take it as a compliment, give the person a salute and continue with whatever he was doing. Cassie: Cassie would take it as an uncertain compliment (“Umm… Thank you?”) meanwhile thinking either person involved doesn’t know her parents well enough to make that kind of remark or knows too much about them. James and Mac: Emilia and Robert disagree on how to handle the Mac situation, Robert thinks they should talk to him about it (or at least take him to a therapist), Emilia is of the situation that there’s no point talking to him about it, she doesn’t think there’s anything she can say that can make the situation better. Emilia would prefer to wait until Mac is ready to talk about it, which may seem weird because she’s the exact opposite with James. Beth: Isaac doesn’t drink at all and Claire is an high-functioning alcoholic, so there’s a fair amount of self-denial and Cognitive Dissonance there. Isaac tries to get her to cut back and has always reacted angrily to Claire encouraging Beth and Mary to drink when they were younger. Cassie: Cassie’s mother cares very much about appearances and social-value/social perceptions, Cassie’s dad doesn’t particularly care but is willing to play along in order to placate her. James and Mac: Emilia and Robert found that the hardest part in raising James and Mac was in navigating how different they are, Mac and James tend to be at the opposite end of the spectrum on… pretty much everything. James is oversensitive to stuff, in comparison, Mac is under-sensitive to stuff. Beth: Beth has the same under-sensory problem that Mac has, but the biggest problem here isn’t her parents raising Beth, but Beth having to deal with the fact that both her parents are lacking in parental skills. With regards to Beth’s mother Claire, Beth felt as though she had to be the adult most of the time, as Claire was hyper-emotional, prone to meltdowns and an alcoholic who fluctuated between high-functioning addict and low-functioning addict. Cassie: Cassie has three older brothers, so her parents found it difficult to enforce gender roles and gender expectations upon Cassie, although I will acknowledge these are self-imposed difficulties that her mother struggled with, her father doesn’t particularly care. James: James’s most vivid memory of his biological father isn’t so much a visual image, but rather the smell of tobacco mixed with alcohol (the smell of alcohol is more triggering than tobacco) and the feeling of a tense atmosphere but not understanding why. His most vivid memory of Robert is when he took James to his first Karate lesson, they arrived half an hour early so that James could look around the church (suss out the layout) and ask questions before the lesson started. James recalls Robert being there the whole time (he often looked over to make sure Robert was still there). Beth: When Beth and Mary were young, they would build a pillow fort in the living room and wait for their father or mother (or sometimes both) to come home from work, Beth and Mary would play a game of who could stay awake the longest. Beth’s most vivid memory of her mother was when they had a massive argument, Claire became verbally abusive then became physically abusive, Beth doesn’t remember the words precisely but she remembers the look on Claire’s face. Mac: Mac distinctively remembers the looks of relief on his parents faces when James returned to inform them that Cassie had been safely delivered and that she had managed to convince her family she had been staying over at a friend’s place. Mac feels as though his parents took James’s side in the Cassie incident. Cassie: Cassie has fond memories of family camping trips. Mac and Beth: rather loud children, both of them are clumsy and talkative, Beth was often singing as a child and Mac would often bang stuff together loudly. Beth: Beth’s mother has an obsession with British Royalty, specifically Princess Diana, so she named her Elizabeth, but Beth prefers the shortened version. Cassie: There’s no real significance in the choice of Cassie’s name (full name being Cassandra). 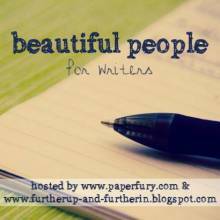 Well that’s all the questions answered, if readers are also participating in The Beautiful People Writing Prompt, let me know in the comment section.